Sofia, Bulgaria is a brilliantly off-the-beaten path city full of awesome surprises. With its culture-rich atmosphere, brilliant sights and abundance of cool activities, this often overlooked European capital has plenty of layers to uncover (at times, literally). Here’s an insider’s guide on things to do in Sofia, alongside where to stay, what to eat and everything else you need to know. This Sofia guide features advice from Maria Angelova of 203challenges.com, a Sofia expert who has lived in the city for more than 10 years. 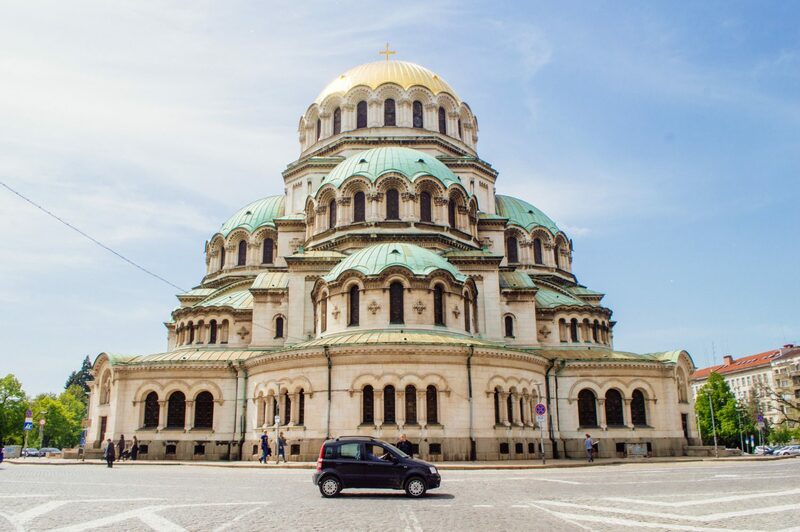 Read on to discover Maria’s insider tips on experiencing Sofia, with all the important facts and recommendations you need to know for the perfect stay. Sofia Nightlife: Where to go out! The best time to visit Sofia: Summer, when there’s many free outdoor events and festivals. Sofia tends to get bland and gray in the winter. The best way to get around: Subway (Sofia’s metro system is very new, affordable, clean and convenient). Otherwise, it’s easy to navigate the city on foot (especially in the centre). Be wary of taxi scams, especially at transportation hubs like the airport or train station. Try to agree on a rate beforehand. Currency: Bulgarian lev only. It’s illegal to pay in any other currency. Shops normally accept credit and debit cards. Cool events and festivals to look out for: A to Jazz Festival – a free, open air music festival in South Park that takes place in the summer. If you only have one day in the city, you absolutely cannot miss… the Free Sofia Tour. Saint Alexander Nevsky Cathedral: a highlight of every Sofia sightseeing experience, with its gold-covered domes shining from afar. One of the main symbols of the city, and a great start if you’re wondering what to do in Sofia first. The Sofia History Museum: with a real-life retro tram (actually half of it, but you can still enter and feel what it was to ride it a century ago) and king’s carriage. Vitosha Mountain: just a 30-minute ride from the city center. Here, you’ll be able to breathe fresh air in a natural park. If you don’t fancy hiking, there’s a chair-lift to its top Cherni Vrah (the Black Peak). The Saint Sophia Statue: erected in 2000, this is another symbol of Sofia, still sparking arguments because it was designed to represent the saint but actually features many attributes of the ancient goddess Sophia (the goddess of wisdom). Fun fact: in its place used to be a statue of Lenin. National History Museum: featuring national monuments and ancient Thracian treasures. Sofia Free Walking Tour: offered daily. Provides a great overview of the city for first timers through a 2 hour walking tour with enthusiastic, local guides. Works on a tip basis, so you pay what you think the tour is worth. Of all the things to do in Sofia, this is one of the best! More info here. The City Garden (AKA Crystal Public Garden): with a mix of hipster and laid-back semi-outdoor bar where life is pumping in the evenings. Enjoy the drinking fountains: where you can drink mineral water directly on the street, for free. The biggest are located near the Sofia History Museum. Shishman Street: known for its healthy stores and restaurants, second-hand shops, cool bars, and art shops. The Summer Stage in Borisova Gradina Park: where classical concerts, festivals, and outdoor film screenings take place all night long. The Bells (Kambanite): a nice natural area on the outskirts of Sofia where you can take a walk or camp. 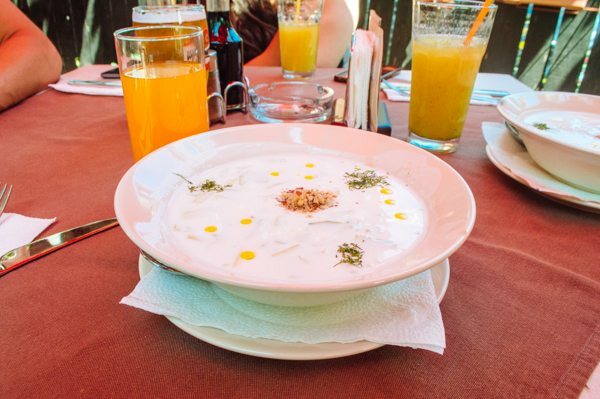 Tarator: a delicious, cold soup that mixes yogurt, cucumber, garlic, walnut and dill. Available at most food venues, but I love the one at Before&After. Kyufte and kebapche: grilled meatballs made of minced meat and spices. A staple of Bulgarian cuisine. Available at pretty much every food venue in the city, but the ones at Skara Bar are amazing. Lyutenitsa: a spicy vegetable spread that goes amazing with bread, meat and pretty much anything. You can find it in every supermarket. Well, you already know that eating is one of the best things to do in Sofia… Now the question is where? Don’t miss these great restaurants. An amazing place to try the traditional Bulgarian breakfast food – mekitsa (fried dough similar to a doughnut). Traditional Bulgarian cuisine in traditional setting, many of the products are home-grown. Cheap and tasty, in the center! Local and international cuisine in artful setting, a local’s favorite. Rainbow Factory: homemade cookies and sweets, plus the best coffee in Sofia. Nedelya: a cake bakery, the largest chain in Bulgaria with amazing cakes. Try the French Kiss cake! Social Cafe: the cafe to be if you want to be in the middle of the hustle and bustle of the city, located in the pedestrianized Vitosha Boulevard. PM Club: a classy, fancy dance music night club frequented by famous people too. Reservations are highly recommended. PS: be wary that bouncers often give preferential treatment to locals over visitors (as reported in many online reviews). Once Upon A Time Bibliotekata: more casual, located in the building of the National Library, dance music and hits. RockIT: probably the best rock club in Sofia with live concerts, tributes of famous rock bands and quiz nights. 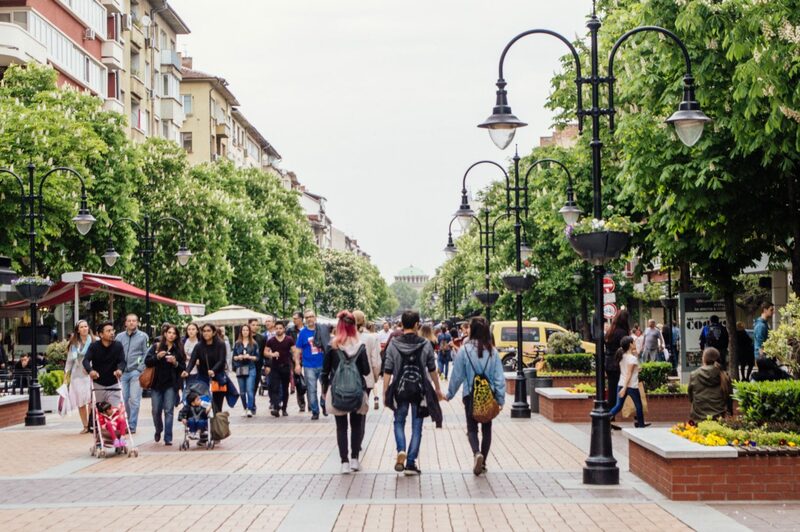 There are TONS of things to do in Sofia, but most of them are clustered around the center of town. That’s why Sofia’s city center is the best neighbourhood to stay in, no reason to go farther! Browse the best deals for hotels in Sofia’s city center. Hostel Mostel – A fun, social hostel close to Sofia’s main attractions. Both dorms and private rooms available – it’s very no frills but convenient and social. Free WiFi, common room, kitchen and breakfast are available. Budapest Hotel – An affordable three star hotel within a 5 minute walk of the Sofia train station. In-house restaurant available, with delicious breakfast options and fast, free WiFi throughout the hotel. Grand Hotel Sofia – Located in the heart of the city, close to most of Sofia’s main attractions. Fitness center, hair studio, open-air terrace and free WiFi available. Looking for affordable accommodations in Sofia? AirBNB is always a good option. 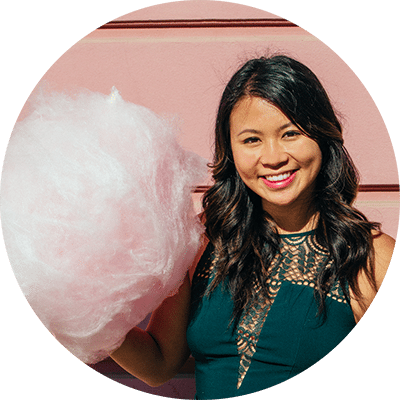 Click here to save $50 on your first booking, and check out my beginner’s guide to Airbnb. If time permits, hiking in the Vitosha Mountain is one of the best things to do in Sofia for beautiful views, depending on the weather conditions and smog. Central Market Hall: A covered market in the center of the city. Plovdiv: the second biggest city in Bulgaria with a lovely old quarter perched on three hills. One of the best places in Bulgaria for arts and culture. Compare the best deals on Plovdiv day trips from Sofia. Koprivshtitsa: a historical town at the foot of the mountain showing much of what Bulgaria looked like 100 years ago. Compare the best deals on Koprivshtitsa day trips. Rila Monastery: the biggest monastery in Bulgaria, just an hour driving from Sofia, a UNESCO heritage site. 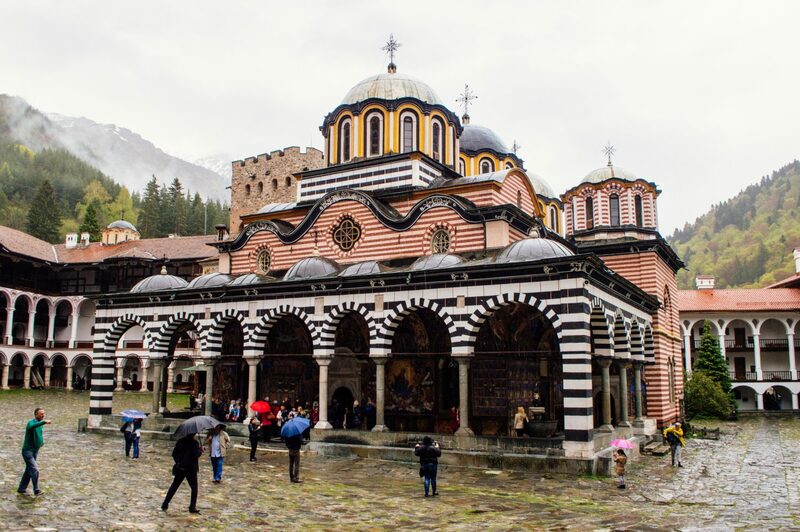 Compare the best deals on Rila Monastery day trips. Avoid the area around the Central Railway Station at night. Zaharna Fabrika and Orlandovtsi should also be avoided at night. Maria is a 20-something traveling disaster roaming the world. She’s crazy about mirto from Sardinia, speaking in foreign languages (even if she can’t, actually mostly if she can’t!) and studying fortune-telling. She is one of the founders of 203challenges.com and, god forbid, its editor-in-chief. Thanks for reading Happy to Wander’s Sofia Insider Guide! Please note that this post does contain affiliate links that come at no extra cost to you, but helps net a small commission to keep the site running. Thanks as always for your support.